This Is Us is the seventh studio album from American pop group Backstreet Boys. It was their second and last album as a quartet. It was released on September 30, 2009 in Japan through Sony Music Japan, October 5, 2009 in the UK through RCA, and October 6 in the U.S. as their final studio album through Jive Records. On the album, the group has reunited with previous collaborator and producer Max Martin (responsible for the previous hit "I Want It That Way") to try and create their best record since their 1999 worldwide hit album Millennium. They worked with Ryan Tedder, Claude Kelly, Jim Jonsin, RedOne, Ne-Yo, Brian Kennedy, Alex James, Pitbull, Eddie Galan, Rami Yacoub, Kristian Lundin, and T-Pain amongst others for the album as well. The album debuted at number 9 on the US Billboard 200 making it their seventh top ten album following Unbreakable in 2007. RedOne produced the album's lead single "Straight Through My Heart" which was released in August/September 2009 and reached number 1 in Taiwan, number 3 in Japan, number 5 in Spain, number 106 in Billboard Hot 100, 19 in Canada, 72 in the UK, and 18 on the US Hot Dance Club Songs chart. It was their final album under Jive and their last album as a quartet before original member Kevin Richardson rejoined the band on April 29, 2012. In an interview with Extra TV, the group confirmed the title of their seventh album to be This Is Us. In the official press release RCA/Jive Records describes the album as "a finely crafted R&B and pop album from four talented musicians who love what they do and who maintain the rare relevance in an industry that often disposes of pop acts. The 11 songs that make up album are the sounds of four skilled singers with a similar vision, who have dealt with the trials and tribulations that accompany fame at an early age and who came out as one of the most successful groups of all time. It shows remarkable growth as songwriters and continues to give us songs that has made millions smile." On May 1, 2009, the Backstreet Boys management team expressed discontent at the fact that four recorded songs had been leaked on the internet. In an interview, A. J. McLean said that the group were "P.O.ed that music had leaked especially since extra care had been taken to keep the record secret". In the end, however, the group used the feedback from the leaks to help guide the direction of the album and even the song selection by comparing fan reviews to what producers thought about the songs. It was later revealed in 2011, that songs recorded for This Is Us were targeted by the German hacker, Deniz A., also known as DJ Stolen. In July 2010, the Rasch law firm logged a criminal complaint against DJ Stolen for "constantly placing hacked songs on the internet". Amongst those songs listed in the complaint was one called "Masquerade", described at the time as a new recording by the Backstreet Boys. However, despite leaking, the song is still included on the album. Regarding their collaboration with RedOne, McLean remarked that it had been largely a last minute affair. Due to timing, the group was not able to make any recordings with the in-demand producer; however, near to the album's turn-in date, RedOne revealed that he had worked on three songs for the group and was more than willing to collaborate. It was also revealed that there had previously been 5 or 6 songs in the running for the lead single, although a Kevin Borg production titled "PDA" was most likely to be released; however, the RedOne production felt like "it was meant to be". One Tedder song, "Shadows", which was co-written by McLean was written for this album, but failed to make it, so Simon Cowell bought the song for Leona Lewis's second album Echo but in the end felt it more suited for a boyband and it was featured on Westlife's 10th album Where We Are. One song that was not included on the album, "All in My Head", was later re-recorded as a duet with fellow boy band New Kids On The Block and featured on the 2011 collaboration album NKOTBSB. The group simultaneously released the standard and deluxe editions of the album. The deluxe edition (limited first edition in Japan) featured a DVD with live performances of previous singles at The O2 Arena in London, along with the music video for the first single. The first single "Straight Through My Heart", was premiered on the group's website on August 17 and released to radio the following day. It peaked at number 3 on the Japan Hot 100 and 18 on the US Hot Dance Club Songs chart. It was certified platinum in Japan. The second single "Bigger" was released in the UK on December 14, 2009 and released in the US on February 1, 2010 in AC radios. This is Us received generally favorable reviews from critics. At Metacritic, which assigns a normalized rating out of 100 to reviews from mainstream critics, the album received an average score of 67, based on 5 reviews. AllMusic's Stephen Thomas Erlewine found the album's hooks more attention-grabbing than Unbreakable and the production more modern than pandering compared to New Kids on the Block's The Block, concluding that "the group sounds great for their age, and they sound like they're at their peak – which is no guarantee of a hit, but it sure makes for a better album than they've produced in quite a while." Mikael Wood of Entertainment Weekly praised the album for bringing back the band's old teen-pop sound with new producers and delivering them with confident vocals. Jason Lipshutz of Billboard admired the band's "foray into throbbing electronica" mixed in with the typical pop fare, concluding that it "may be a stepping stone in ushering [Backstreet Boys] away from their days on pop radio and firmly through the club door." August Brown of the Los Angeles Times gave credit to the band for continuing to deliver catchy tracks but ultimately called the album "a competent but very late-adopted pop-trance slurry." John Terauds of the Toronto Star noted that the tracks have an '80s influence to them but said that "nothing sounds truly original." He also added that it will appeal only to diehard fans of the band. Jonathan Keefe of Slant Magazine criticized the album's producers for crafting songs that range from retreads of other songs ("Straight Through My Heart", "If I Knew Then" and "Undone") to "flat-out embarrassing" ("She's a Dream" and "P.D.A. "), concluding that, "No matter how strong their voices might remain and no matter how sincere they may be about keeping their career going, Backstreet Boys' collaborators have failed them here." 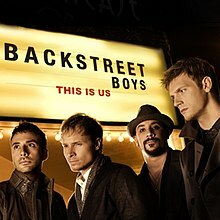 This Is Us debuted and peaked at number nine on the US Billboard 200 the week of October 24, 2009 with 42,000 copies sold, making Backstreet Boys the first group to have its first seven charted albums in the top 10 of the chart since Sade. In its second week, Billboard reported that the sales dropped by 79.8% to 8,000 units and the album moved to number sixty four on the Billboard 200. It was present on the chart for five weeks. As of June 2011, the album has sold 98,000 copies in the United States according to Nielsen SoundScan. In the United Kingdom, the album debuted at number thirty-nine on the UK Albums Chart, the week of October 17, 2009 and remained on the chart for only a week. 2. "Best That I Can"
4. "Don't Try This at Home"
6. "Story of My Life"
10. "All in My Head"
13. "Trouble (feat. Ne-yo & Usher)"
^ "Backstreet Boys' Biography". BackstreetBoys.com. Retrieved 2010-02-28. ^ a b "This Is Us(Normal Edition)【CD】-Backstreet Boys｜Dance｜Dance & Soul｜Music｜HMV ONLINE Online Shopping & Information Site". Hmv.co.jp. Retrieved September 7, 2009. ^ "Backstreet Boys At Work On New Album, Solo Disks". Billboard.com. Retrieved 2008-07-28. ^ a b "PR Newswire Press Release". News.prnewswire.com. 2009-07-28. Archived from the original on 2009-10-01. Retrieved 2009-08-26. ^ "Backstreet Boys At Work On New Album, Solo Disks. Billboard.com. July 24, 2008". Billboard. Retrieved June 18, 2012. ^ "Backstreet Boys This Is Us Review". Prefix. Retrieved June 18, 2012. ^ "Never Gone - Backstreet Boys". Billboard.com. 2005-07-02. Retrieved 2009-10-19. ^ Warner Bros. Online. "Extra TV Exclusive". Extratv.warnerbros.com. Retrieved 2009-08-26. ^ a b c d "Digispy: Interview with A. J. McLean about new BSB". digitalspy. Retrieved 2009-07-31. ^ Dahlkamp, Jürgen (27 January 2011). "Lady Gaga, Ke$ha and the German Hacker Heist". Der Spiegel. Retrieved 29 January 2011. ^ "Music - News - Westlife 'given Leona Lewis song'". Digital Spy. 2009-10-20. Retrieved 2010-04-07. ^ Praxis Media. "Radio1 Rodos Greece ::: UK Forthcoming Singles ::: Charts, DJ Promos, Dance, Lyrics, Free Mp3 Samples Downloads". Radio1.gr. Retrieved 2010-04-07. ^ backstreetboys. "Twitter / backstreetboys: Bigger going to Hot AC rad". Twitter.com. Retrieved 2010-04-07. ^ a b "Reviews for This Is Us by Backstreet Boys". Metacritic. CBS Interactive. Retrieved June 30, 2012. ^ a b Erlewine, Stephen Thomas. "This Is Us - Backstreet Boys". AllMusic. Retrieved July 14, 2011. ^ a b Billboard (October 3, 2009). The Billboard Reviews: Albums. 121. Nielsen Business Media, Inc. p. 32. ISSN 0006-2510. Retrieved August 22, 2015. ^ a b Wood, Mikael (September 30, 2009). "This Is Us". Entertainment Weekly. Time Inc. Retrieved July 14, 2011. ^ a b Brown, August (October 6, 2009). "Backstreet Boys - This Is Us". Los Angeles Times. Tribune Publishing. Retrieved June 30, 2012. ^ a b Keefe, Jonathan (October 7, 2009). "Backstreet Boys: This Is Us". Slant Magazine. Retrieved June 30, 2012. ^ a b Terauds, John (October 6, 2009). "CD Pick of the Week: Backstreet Boys". Toronto Star. Star Media Group. Retrieved July 14, 2011. ^ a b c "Tall Falls: How The Mighty Drop (From The Top 10)". Billboard — April 2-9, 2011. Billboard Magazine. Google Books. p. 41. Retrieved September 23, 2017. ^ Trust, Gary (October 15, 2009). "Chart Beat Thursday: Michael Buble, Michael Jackson, Kiss". Billboard. Retrieved 2017-09-23. "This Is Us" debuts at No. 9 on the Billboard 200, making Backstreet Boys the first group to send its first seven charted albums to the top 10 since Sade, whose all seven career entries between 1985 and 2002 have made the top tier. ^ a b Trust, Gary (June 5, 2011). "Ask Billboard: Home Charts Edition". Billboard. Retrieved 2017-09-23. ^ "Backstreet Boys | full Official Chart History | Official Charts Company". www.officialcharts.com. Retrieved 2017-09-24. ^ "Australiancharts.com – Backstreet Boys – This Is Us". Hung Medien. ^ "Austriancharts.at – Backstreet Boys – This Is Us" (in German). Hung Medien. ^ "Ultratop.be – Backstreet Boys – This Is Us" (in Dutch). Hung Medien. ^ "Ultratop.be – Backstreet Boys – This Is Us" (in French). Hung Medien. ^ "ABPD CD - TOP 10 Semanal". (in Portuguese). Associação Brasileira dos Produtores de Discos. Retrieved August 9, 2010. ^ "Backstreet Boys Chart History (Canadian Albums)". Billboard. Retrieved August 5, 2010. ^ "Danishcharts.dk – Backstreet Boys – This Is Us". Hung Medien. ^ "Dutchcharts.nl – Backstreet Boys – This Is Us" (in Dutch). Hung Medien. Retrieved September 5, 2010. ^ "Backstreet Boys: This Is Us" (in Finnish). Musiikkituottajat – IFPI Finland. ^ "GFK Chart-Track Albums: Week 41, 2009". Chart-Track. IRMA. ^ "Italiancharts.com – Backstreet Boys – This Is Us". Hung Medien. ^ "Oricon Top 50 Albums: 2009-10-12" (in Japanese). Oricon. Retrieved September 5, 2010. ^ "Mexicancharts.com – Backstreet Boys – This Is Us". Hung Medien. ^ "Portuguesecharts.com – Backstreet Boys – This Is Us". Hung Medien. Retrieved August 9, 2010. ^ "Scottish Album Charts". Official Charts Company.com. Retrieved 2017-06-09. ^ "Spanishcharts.com – Backstreet Boys – This Is Us". Hung Medien. ^ "Swedishcharts.com – Backstreet Boys – This Is Us". Hung Medien. ^ "Swisscharts.com – Backstreet Boys – This Is Us". Hung Medien. ^ "Backstreet Boys | Artist | Official Charts". UK Albums Chart. ^ "Backstreet Boys Chart History (Billboard 200)". Billboard. Retrieved August 5, 2010. ^ "This Is Us(+DVD, Limited (First Edition))【CD】-Backstreet Boys｜Dance｜Dance & Soul｜Music｜HMV ONLINE Online Shopping & Information Site". Hmv.co.jp. Retrieved September 7, 2009. ^ "This Is Us: Backstreet Boys: Amazon.co.uk: Music". Amazon.co.uk. Retrieved September 7, 2009. ^ "This Is Us: Deluxe Edition: Backstreet Boys: Amazon.co.uk: Music". Amazon.co.uk. Retrieved September 7, 2009. ^ "Brazilian release date". saraiva.com.br. Retrieved October 6, 2009.